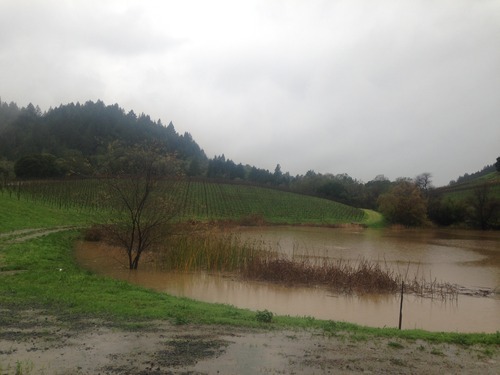 Rain has come early to wine country this fall. 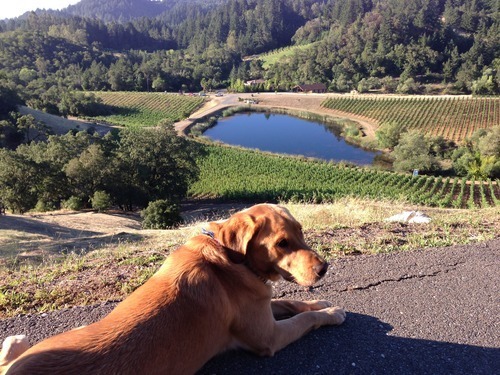 Fortunately Kinsella Estates benefits from being in our sun drenched private valley, 600 feet above the Dry Creek and Russian River. 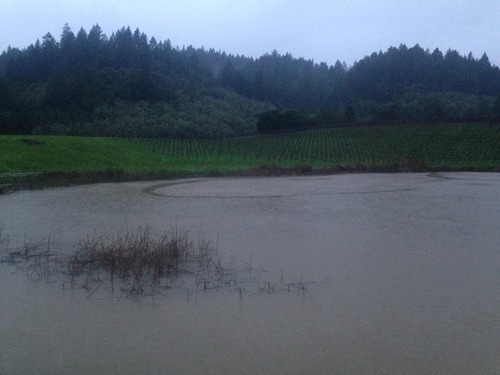 Not only does this put us above the Russian River Valley fog most of the time, but also, we are not subject to any of the very occasional flooding from those rivers. 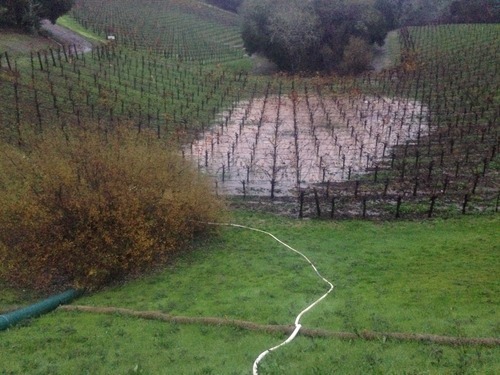 The arroyo that feeds Spencer Lake drains a large watershed from the surrounding hills – which almost always means the deep capacity flat-bottom lake will fill early from the winter rains in time to provide plenty of irrigation water for the vines, regardless of how warm the upcoming summer is. In fact, we could actually miss an entire season of rainfall and have enough capacity for two harvests. 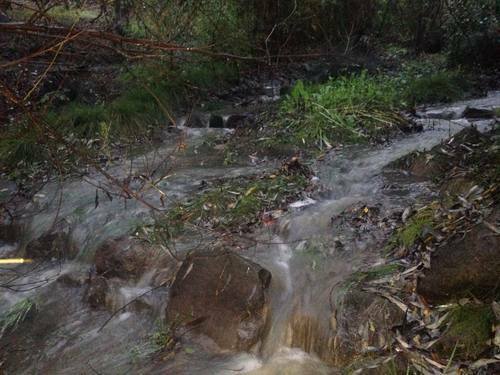 The early December rain soaked the valley and hills and the arroyo ran with water adding five feet of water to Spencer Lake. 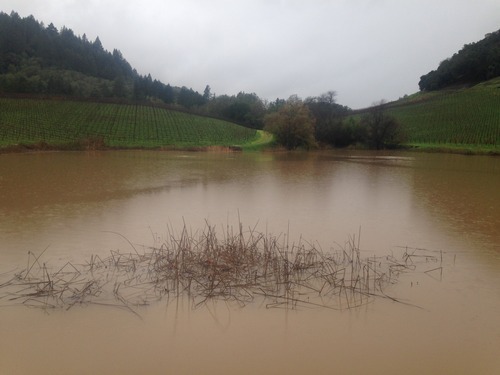 Then, in the early morning of December 11th, the Healdsburg skies opened up and 9.5 inches fell within a five hour period. 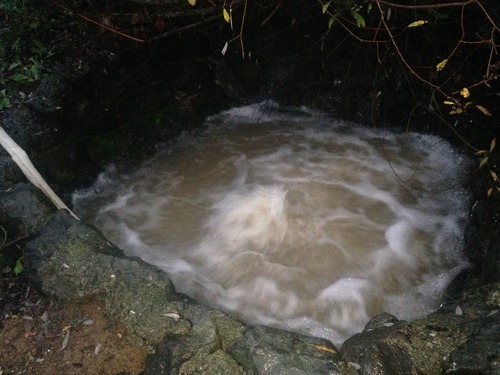 The arroyo ran with such volume that the lake filled up and rose above the level of the spill pipe. 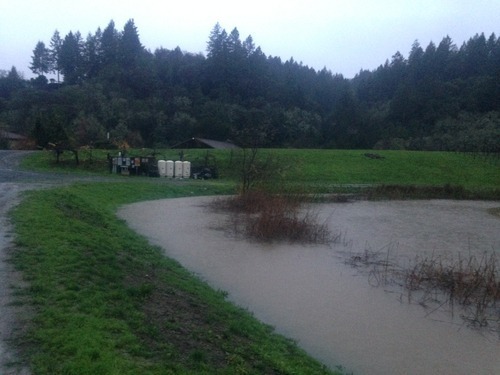 Raul Duran, our fabulous ranch hand, was there before dawn and started the Honda pump to pull water out of Spencer Lake to pump over the dam down the backside into the spillway. So dam failure was averted and we now already have a full lake for the coming season. Spencer Lake before the rains. Spencer Lake after the rains on December 11th. 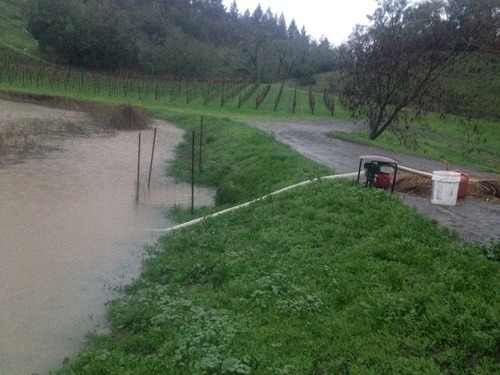 Heavy Rains in Healdsburg this morning! Spencer Lake is overflowing. 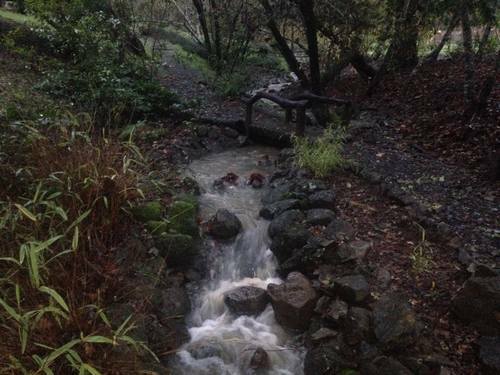 Thankful for the recent rains! Harvest in the estate vineyard this morning. Copyright Kinsella Estates 2015 - All Rights Reserved.